One of my life mottos is, “If an era doesn’t have crazy hair, I don’t want to know about it.” So, while I’m not sure if I absolutely LOVE the 1830s, I very much respect it for having riDONKulous hair. Particularly in the first half of the decade, women’s hairstyles got high on top of the head in complex arrangements that were called “Apollo knots,” hairstyles “à la giraffe,” and probably other fabulous names that I don’t know about. 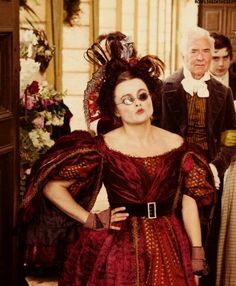 So, let’s take a look at the films and TV series that have gotten these ridiculously fabulous late Georgian/early Victorian hairstyles right. I will say, I had to scrape the bottom of the barrel to come up with a fifth. 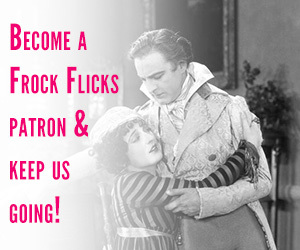 This is sad, because clearly filmmakers are afraid of over-the-top hairstyles. 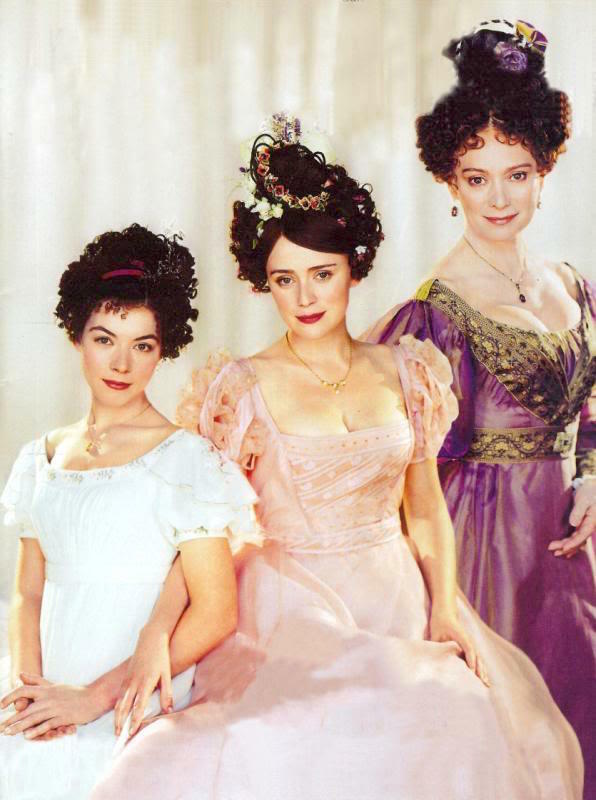 Movies/TV shows that you would think would get this right — Les Miserables, even the 1940 Pride and Prejudice, which went full 1830s in terms of costume — have shied away from embracing these hairstyles. That being said, Sally Hawkins as Jane Eyre’s aunt Mrs. Reed does rock a lovely, high, braided ‘do in the 2011 adaptation. The hair designer was Daniel Phillips (He Knew He Was Right, Tulip Fever). Thackeray’s novel was published in the late 1840s, but set in the 1810s during the Napoleonic wars. So, it’s far too early for crazy 1830s hair … but the 2004 film goes there nonetheless. Okay, so there are a lot of 1810s-appropriate hairstyles, but when Becky Sharp is at her highest social status, she rocks some complicated Apollo knot hairstyles. And, the film’s costumes are stylized enough that it works, especially since it’s pretty! The hair designer was Jenny Shircore (Cousin Bette, Elizabeth, Girl with a Pearl Earring, The Phantom of the Opera, Elizabeth: The Golden Age, The Young Victoria, The Invisible Woman, Macbeth). 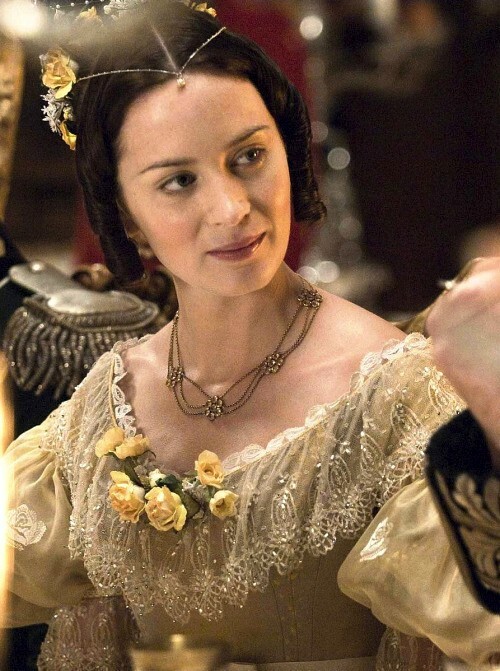 The novel takes place between about 1812 and 1840, so I guess it makes sense to put adult Estella into intricate 1830s updos? It’s the same costume designer as Vanity Fair (2004), so I also think there’s some cross-over going on. 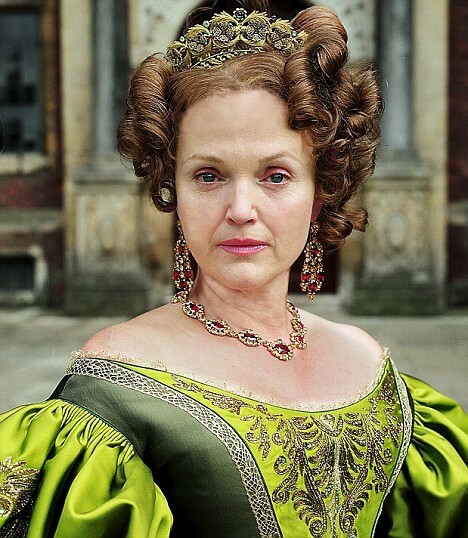 It’s not clear to me who was the hair designer; I think it was Luca Saccuman (Queen of the Desert). 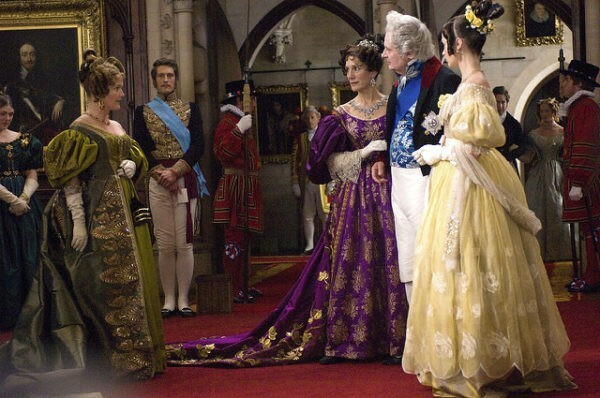 The Young Victoria has such lovely 1840s costumes that I sometimes forget that the first part is set in the late 1830s as Victoria comes to the throne. In this first part, the soon-to-be queen has beautifully complex 1830s-style updos, plus the current queen (Queen Adelaide) and Victoria’s mother (the Duchess of Kent) pretty much stick to the 1830s styles throughout. The hair designer was Jenny Shircore (Cousin Bette, Elizabeth, Girl with a Pearl Earring, Vanity Fair, The Phantom of the Opera, Elizabeth: The Golden Age, The Invisible Woman, Macbeth). One of these days I’m going to do a detailed Throwback Thursday on this BBC miniseries, because it’s SO GOOD, from casting to story to costumes. But probably the best aspect is how well they get 1830s hair. Main character Molly spends most of the series in pretty updos that work well with her naive, country character. 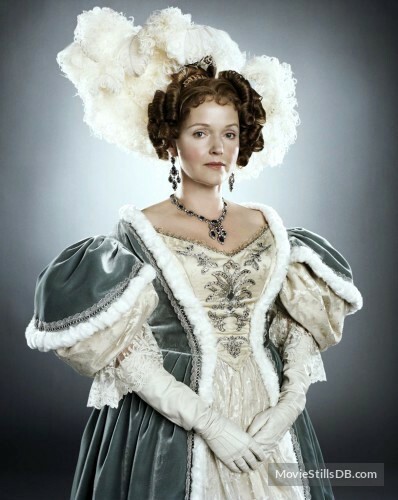 But luckily we get annoying stepmother Hyacinth and fabulous stepsister Cynthia to up the hair game, plus local aristocrat Lady Harriet (even if they randomly give her a French Revolution-era crop in the last episode). The hair and makeup designer was Lisa Westcott (The Madness of King George, Shakespeare in Love, Stage Beauty, and the 2012 Les Misérables). Did I miss any key OTT 1830s hair in movies or TV series? I loathe Great Expectations — LOATHE, I tell you! — but sure, I’ll take that hair, it’s fun. In still photos. As long as I don’t have to watch the movie. 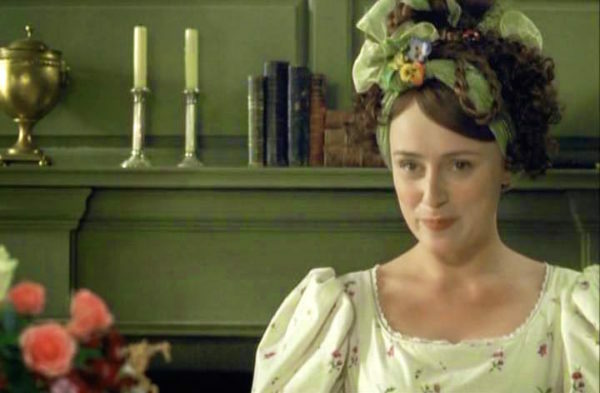 The 2008 BBC adaptation of “Little Dorrit” has some marvelous examples of 1830s hair, in particular that of the character of Mrs. Merdle and Fanny Dorrit after the family regains their fortunes. Yes, Megan, I think that was the first time I noticed that bizarre style. Thought it was just a designer’s whim to highlight the artifice of those characters (loved them both!). Now I know it actually was a thing! With a name! Once again, thanks, FF! Yessssss, Throwback Thursday on W&D, please! I adore that movie! The Fairy Tale Theater Episode of Cinderella was loosely placed in the 1830’s (through a VERY 80’s lens & cast), and the Stepmom/Stepsisters sport some silly updos, and historically, the most accurate silhouettes overall…..LOVE FTT! Please Please Please do Wives and Daughters! It is my favorite! Wives and Daughters is a favourite of mine as well, Emily. Don’t you just love Everything about it. Molly and Cynthia ganging up on Hyacinth is so comic. Costumes are bang on IMHO and hair is perfect. Always thought short hair on Molly’s noble protectoress was due to illness. But whatever, spies proved stepsisters could get along. Ah, the glorious 1830s Mad Hair ‘Wives and Daughters’ (although I did want to slap Roger Hamley throughout until he saw reason). My favourite hair shot of the miniseries is one of the new Mrs Gibson (Francesca Annis) actually constructing a completely nutty topknot with hair pieces and ribbons at her boudoir table….. Yes, I loved that bit too. 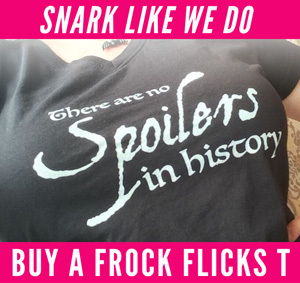 I love W&D, times 1000, so I would be thrilled for a Frock Flicks posting! Cynthia hair is completely cray in that photo — and please explain Lady Harriet’s short hair, I’ve never been able to figure that out. It mentions there was an illness at the great house and sometimes when women got ill they shaved their heads. I am pretty sure this is why her hair is cut so short. In the book there is no mention of any illnesses so there’s not a very compelling reason for it to be in the series.I sort of reread the book to see if there was a reason for that sort ‘do… :S I’ve read some explanation that it was very popular and hip to crop hair short, but that was at least 10 years earlier, and Lady Harriet while very independent and forward (both in manners and fashion) wouldn’t sport a hairstyle so out of date. 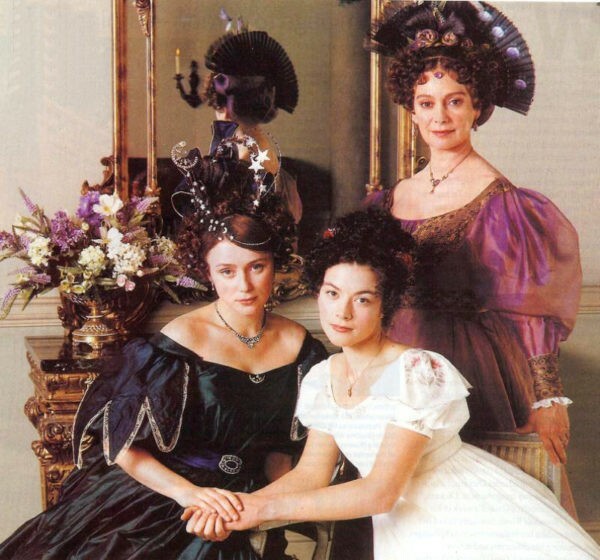 Celia Imrie in the BBC adaptation of “Black Hearts in Battersea” has some very impressive 1830s dresses and hairdos….Can’t find any pictures online though…. I chorus every comment made about Wives and Daughters. I watch it at least once a year. It shares top spot with War and Peace (BBC 1972) as my favourite of favourites. I am really looking forward to the TBT blog on it. I too was thinking of that scene where Hyacinth is braiding a wig (not sure of correct name) while telling Mr Gibson of Cynthia’s engagement.The director had very clearly read the book as it is entirely fitting for her character. 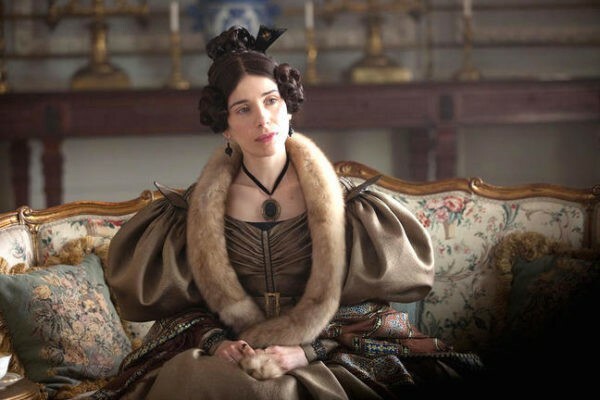 Also as others have remarked I was confused by Lady Harriet’s hair in the final episode. I wondered if it was a Lady Caroline Lamb reference. Did she not set a fashion amongst trendy regency ladies for cropped hair after her attempt to seduce Byron? Not sure how that fits with the time period however. Another W&D lover here! Will so look forward to your tbt rundown of it, I watch it at least once/year (I have the Elizabeth Gaskell collection on dvd and tend to binge them together – oh, now I’m thinking of Richard Armitage’s smouldering Thornton, lol) Love love love Hycanth and Cynthia’s hair! 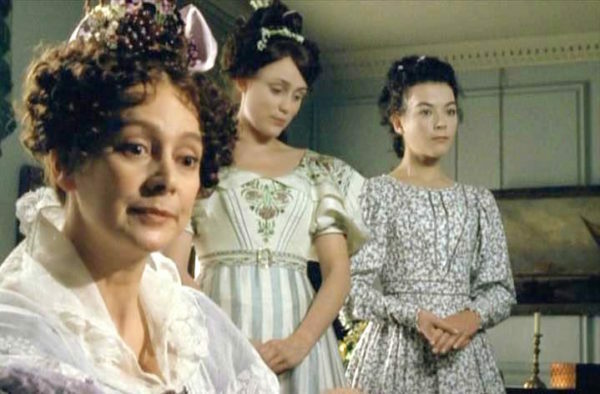 (Among so many other things) And it still totally gets me that Francesca Annis was later Lady Ludlow in Cranford. 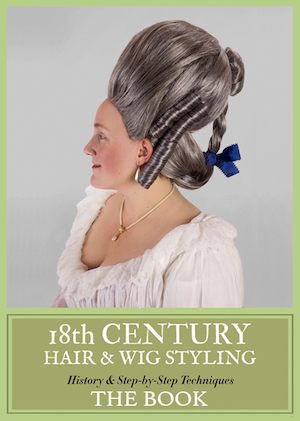 I will also second Mrs Merdle and Fanny Dorritt from the 2008 Little Dorritt for fab 1830s-esque hair, although I do believe it’s set more 1820s…..through most of it, anyway. It so totally works for their characters. Seen ’em all. Young Victoria and Wives and Daughters were my faves. The rest were remakes of remakes of remakes. On the 1830s front, may I recommend ‘Onegin’ (1999) for the blog? Big top-knots abound. My dvd has a rather fun ‘behind the scenes’ documentary in which the costume designer cheerfully admits to making petticoats out of down duvets to get skirt fullness easily…. It’s more interesting for stylish male fashion of the period. Yevgeni Onegin (Ralph Fiennes) gets very nipped in waisted frock-coats, shots of him at his dressing table in a corset, and (my favourite) wears little clay hair rollers and paper rags at night to get the fashionable ‘curls framing the face’ hairstyle….. I loved Young Victoria, even if they do invent some scenes. That movie cemented by undying Fan Girl crush on Emily Blunt! However, I have a question – who is the actor in the photo that leads off this post? He looks so very familiar but I can’t figure out where I know him from. That’s Milner from Foyle’s War. I LOVE 1830s hair! 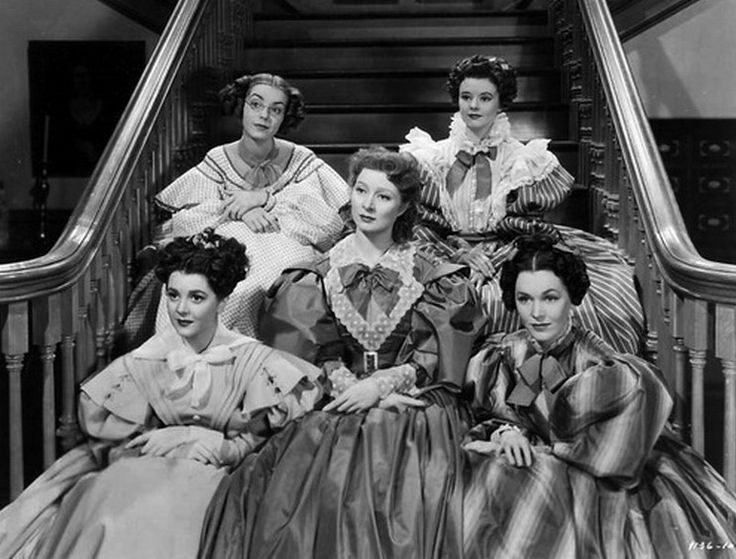 I recently watched the 1940 ‘Pride and Prejudice’ and I definitely agree that for the most part the hair wasn’t accurate (I don’t think Elizabeth once wears her hair up – must be because of the Great Bobby Pin Shortage), some of the other Bennet can be seen wearing hairstyles that a pretty close. This was one of the better pictures I found that shows off all of the sisters’ hairstyles.